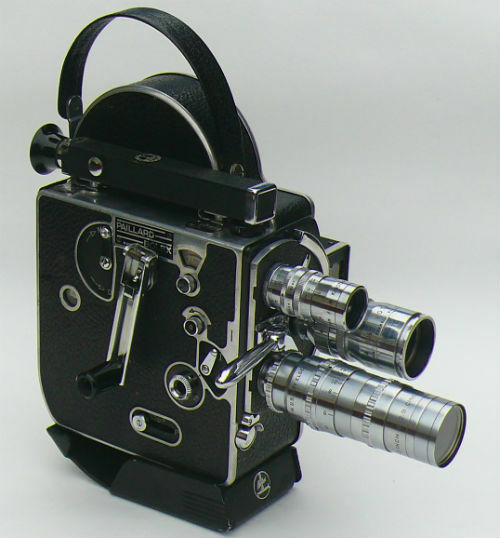 Vintage 16mm movie cameras such as the Bolex H16 Reflex are great motion picture cameras for film students and independent filmmakers who are shooting their first film on a budget. Bolex film cameras are made by Swiss manufacturer Paillard Bolex, a company known for their quality-made motion picture cameras for both professional and home movie use. Pictured above is a spring-wound Bolex H16 motion picture camera from 1955. This camera model is a popular introductory camera for beginning film students and indie filmmakers. The three lenses are replaceable so you can mount a different lens of your choice.